Tray: A Personalized Melamine Square Serving Tray with Chevron Pattern and a Personalized Acrylic Square Serving Tray from LoveyDoveyCreations on Etsy, here. In your dressing room, would you put your nail polish, keepsakes, perfume, and rings on this lovely square? / Room: Welcome to an absurdly glamourous dressing space. Benjamin Moore Feather Grey walls, a chandelier from Overstock, a vanity table from Pier 1 Import, the classic Louis chair, Chevron Rug from RugsUSA, and shelving from Target. Mai K from A Cup of Mai sure knows how to impress on a budget! Image found here. 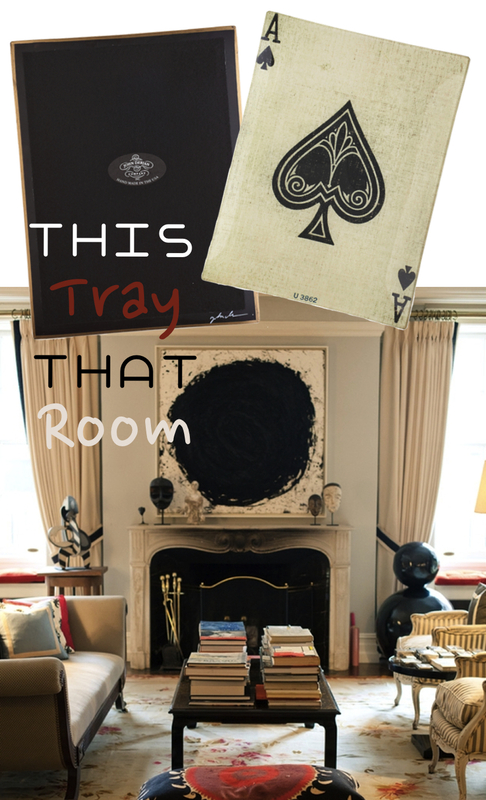 Tray: Win your Poker hand every time with this Playing Card Tray by JOHN DERIAN COMPANY, INC. The glass decoupage tray features an ace playing card, hand painted bottom and is signed by the designer. The tray features a felted back to prevent slipping! Even the Queen of Hearts will want one! Purchase here. / Room: Kate Spade’s eclectic living room tucked away on Manhattan’s Upper East Side is filled with high (Andy Warhols) and low (thrifted statues) end art mingling perfectly. Photograph via Matchbook Magazine, everyone’s favorite field guide to a charmed life! Tray: Introducing the TuttiFrutti Tray! Swedish designer Maria Holmer Dahlgren designed this wonderful dishwasher-safe tray for happier weekdays and more while serving your favorite things. The happy colors and design will be sure to inspire and make you smile. The colorful, graphic contemporary tray is hand crafted from the highest quality Scandinavian birch from sustainable forests, and is produced by a family-run company situated on a small island off the southern Swedish mainland. Doesn’t this tray look straight from the Disney’s ride, “It’s a Small World”? 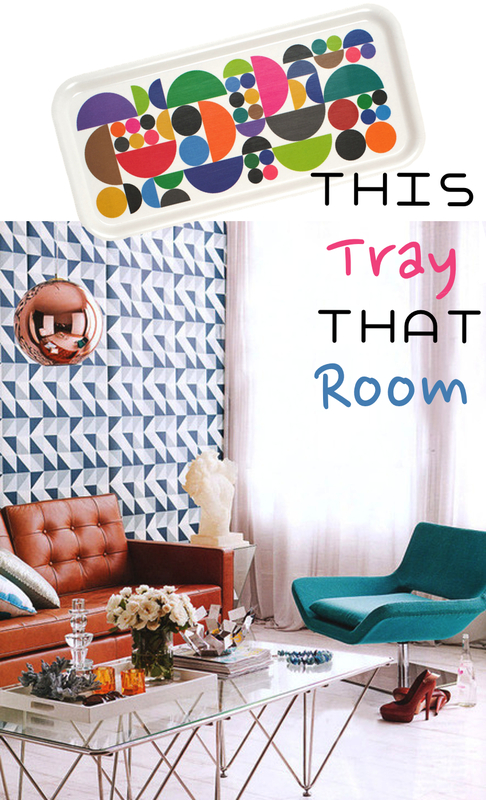 / Room: Found at Dust Jacket Attic, This whimsical midcentury room feels very cartoonish yet modern and serious. The wallpaper is clearly the lynchpin of the whole geometric scheme! Painted in colorful hues, basic shapes like triangles, squares and diamonds (maybe even polyhedrons!) bring a jolt of life to a modern room — and appeal to the pre-schooler in all of us. Photographs by chris warnes, styling by sarah ellison for real living au. Tray: A salute to the grandeur of the Finnish capital Helsinki, this vibrant design by Per-Olof Nyström was created in 1952, one year after Marimekko made its design debut and bright, bold mark in the world of fashion. Revived in celebration of the city’s designation as the World Fashion Capital of 2012, this archival pattern intricately illustrates the Art Nouveau churches, boats and landmarks of Helsinki. 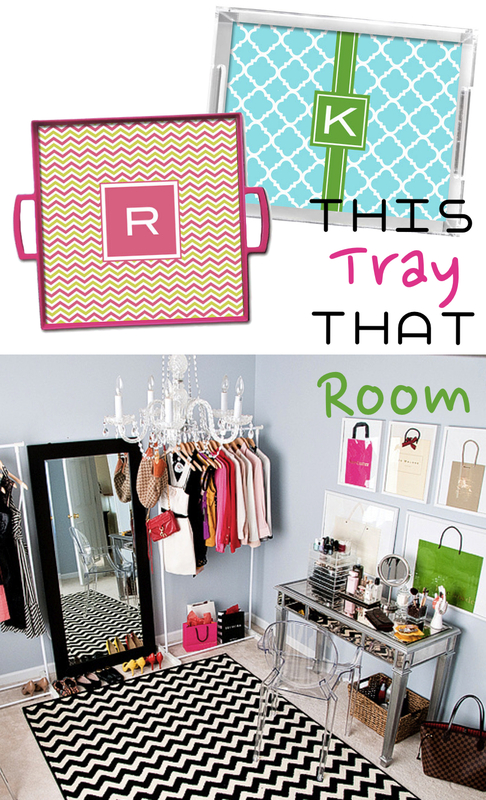 Tray via Crate & Barrel, here. 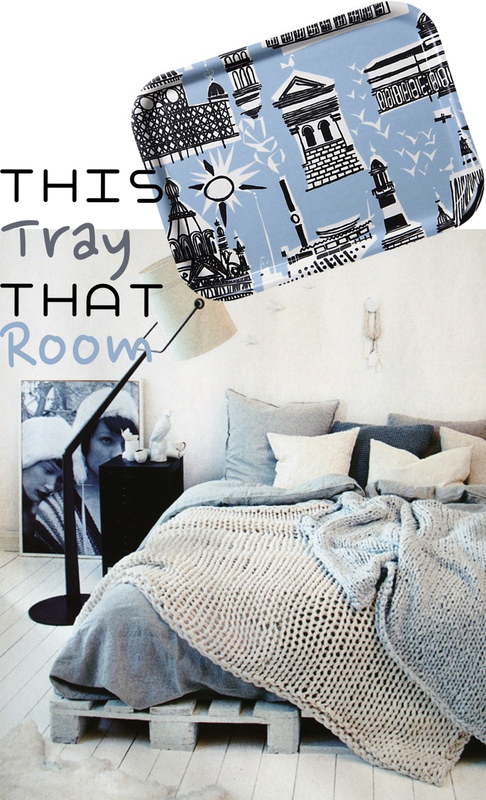 / Room: This cornflower, grey-blue room is a dreamscape of Scandinavian interior design simplicity, modern yet natural elements, photography and cloud colors. The gentle palette is welcoming, simple, honest and cozy. Styling by Kråkvid and D’Orazio via Pella Hedeby at Stil Inspiration.